Our own Wilderland Park is a peaceful, grassy park in the middle of our Frontier Condominiums. 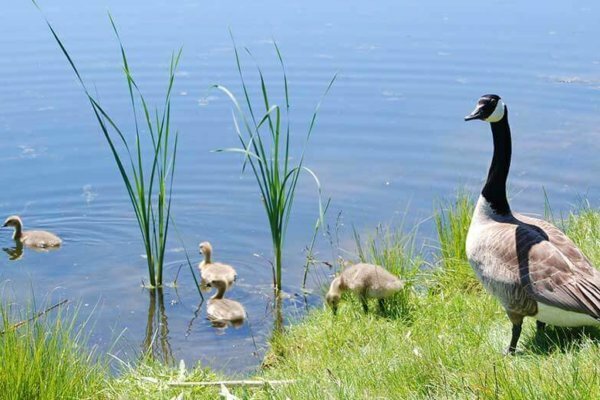 Enjoy a stroll along its walking paths, watch the goslings in one of the ponds, or gather the family at a picnic table in the evening. There are park grills available so bring along charcoal and the fixings for a little summer grilling. Don’t forget your volleyball and take advantage of our sand volleyball court too! Tuesday evenings in the summer, Wilderland Park is the home of outdoor movies. Pack a blanket and snuggle under the stars while enjoying a family movie. It’s a perfect way to end the day. Please enjoy this family activity zone, but be mindful of the rules of use. Please do not allow children unattended near ponds. No bicycles, skateboards, motorized vehicles, dogs, baseball games, lawn darts, horseshoes or rough-housing.